The artist Jean-Michel Basquiat led a mercurial, tumultuous and tragic life. At 25 he was an art-world superstar, and a few months before his 28th birthday, in August 1988, he was dead of a heroin overdose. In many ways he was emblematic of the '80s art world, when a new wave of artists bum-rushed the academy, and unfortunately he was also representative of a decade in which far too many people died young. Yet Basquiat was an enigma, an elusive figure whose multifaceted personality and abundant talent have yet to be fully captured in a movie. Many people close to the New York art scene felt that Julian Schnabel's 1996 biopic, Basquiat, though a showcase for the brilliant acting of Jeffrey Wright in the lead role, was more about the director's flashy sense of visuals and storytelling than about Basquiat's life. Filmmaker Tamra Davis, who shared those sentiments, has created the corrective work Basquiat: The Radiant Child, a film that is now running at Film Forum in New York City and will go on to a series of screenings elsewhere in the country, including Landmark Nuart in Los Angeles on August 20. The film will also air on PBS next year. See the trailer and download the opening scene of the movie here. "I wanted to clear up so many misconceptions about Jean-Michel," Davis says. "People say he was a wild boy and that his work was all intuitive. Jean-Michel was very smart and studied the masters of art." She adds, "He was also very ambitious, and sometimes that leads to getting built up and taken down. It's hard to deal with that kind of rejection at a young age." 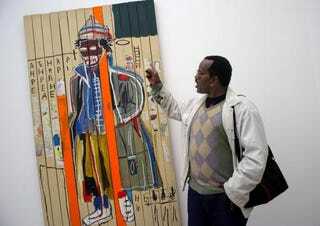 Davis met Basquiat in 1983, when she was a film student at Los Angeles City College and working at a gallery. He was in L.A. for his first major West Coast show at the Larry Gagosian Gallery. The two met via a mutual friend and bonded over their love of cinema. "I was still in that phase of filming everything. I think I always had a camera in my hand and shot all my friends," Davis recalls. She filmed Basquiat painting in L.A., and two years later, at his suggestion, she filmed a lengthy interview with him, with a mutual friend asking the questions. "He said, 'Why don't you make a documentary on me?' He wanted it to air on PBS." After he died, Davis put her footage in a drawer. Basquiat had been angered by friends who profited handsomely from his celebrity by selling pieces that he'd given them as gifts, and Davis felt that making the documentary would have amounted to capitalizing on his legacy. The film is a formal PBS-style documentary with an orderly series of experts discussing both the painter and his era. Basquiat's journey is traced from his middle-class Brooklyn upbringing to his life on the streets as the graffiti artist SAMO. It is likely to make anyone who spent time in New York in the '80s nostalgic for the city's funkier, grittier past, but Davis doesn't romanticize the period. She deals with the death of Michael Stewart, a graffiti artist beaten to death by New York City police in 1983, as well as the tragic toll that AIDS took on the scene. Basquiat: The Radiant Child excels at connecting the dots between Basquiat's inspirations, his methods and his work. Davis uses her footage to show paintings taking shape and Basquiat's rigorous approach to their creation, and she illustrates how his neo-expressionistic style was a response to the minimalism that dominated the '70s. The parade of experts includes Nelson George, Fab Five Freddy and a host of art experts who testify to Basquiat's greatness, but none put it as vividly and succinctly as Yale scholar Robert Farris Thompson, author of Flash of the Spirit: African & Afro-American Art & Philosophy (Vintage). "He had a special talent to take the culture of the streets and translate it into art," says Thompson in one segment. Then, in another, he aptly sums up Basquiat's work: "His paintings are deliberate enigmas that celebrate the complexity of our culture and tell those who don't understand to get with it." At last, a documentary that paints a three-dimensional portrait of a superstar who produced more than 1,000 paintings in a tragically abbreviated life span. Martin Johnson is a regular contributor to The Root. Follow him on Twitter.